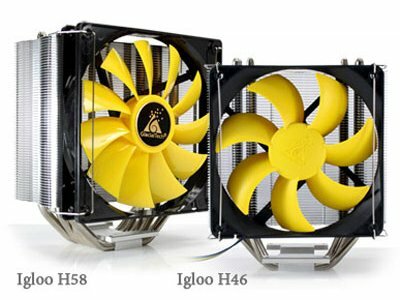 GlacialTech announced three new processor coolers; the Igloo H46 Silent, Igloo H46 PWM and Igloo H58 PWM. The Igloo H46 series measures 130mm x 75mm x 160mm (W x L x H) and weighs 560g. 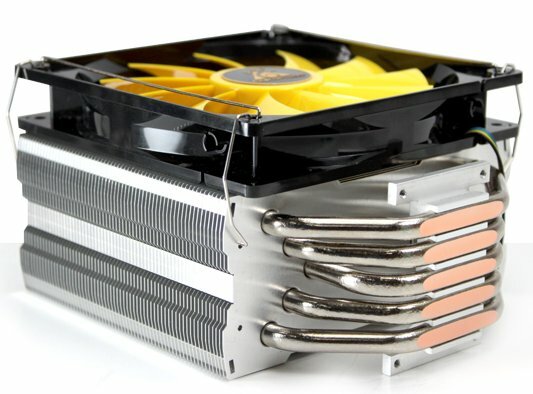 It has four direct-touch heatpipes, an aluminum heatsink and a 120mm fan. The Silent model's fan spins at 1200RPM, it delivers 39CFM at a noise level of 18dBA, while the PWM edition has a 800-1600RPM with a max airflow of 65CFM and max noiselevel of 31dBA. The larger Igloo H58 PWM offers five direct-touch heatpipes, an aluminium heatsink and a 140mm fan with 700-1400RPM, an airflow of up to 60CFM and a noise level of up to 33dBA. It measures 147mm x 89mm x 175mm (W x L x H) and weighs 840g. All three coolers are compatible with the Intel LGA775/1155/1156/1366 and AMD Socket AM2/AM2+/AM3/FM1 platforms. Pricing and availability is unknown. - Igloo H46 & Igloo H58 is a simple name for a promising product, the first CPU cooler series from GlacialTech. The GlacialTech engineers have created a high-performance product. They focused especially on the optimisation of the air stream conduction inside the heat sink to reach more efficient heat dissipation. The result is a combination of two smart innovations that successfully reduce the thermal resistance of the Igloo H46 & H58 - a new milestone in CPU cooler industry. GlacialTech Inc., a diverse provider of cooling, power supply and PC enclosure solutions for consumer and industrial applications and a world-class provider of cost effective cooling components and chassis launches the latest Igloo H46 & H58 Series CPU coolers with Intel LGA1155/1156 and AMD FM1 / AM2 / AM2+ / AM3 sockets. The unique design provides good cooling effect to the components around the CPU. As is usual, GlacialTech comes out with a product that provides highest quality materials and workmanship. The design is clear and functional. The manufacturer decided to waive all creative elements that may have negative influence on the cooling performance. Users can choose out of two different models. The attached PWM fan is certainly equipped with the durable and silent bearing. Price performance, noise performance and weight performance are GlacialTech's three principle design philosophies. Having acquired ISO 9001 and 14001, GlacialTech commits itself to use green materials for its product design and construction and to manufacture its products following green manufacturing processes only.